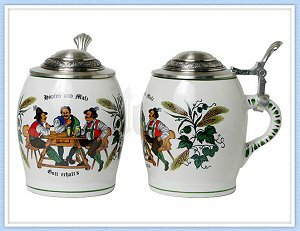 The word stein is a shortened form of Steinzeugkrug, which is German for stoneware jug or tankard. 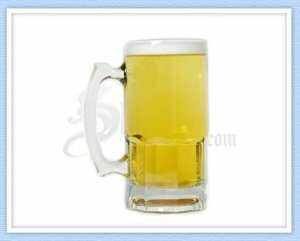 By common usage, however, stein has come to mean any beer container - regardless of its material or size - that has a hinged lid and a handle. Tankard would be more technically appropriate than stein, but these two words are used interchangeably in this book. 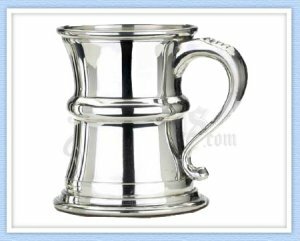 Be warned, however, that some people reserve the word tankard for the all-pewter or all-silver varieties of steins. One final definition: mug is universally used as the name for those vessels that have handles but would never have had a lid. Recall from above that the distinction between a mug and a stein is the hinged lid. This lid was originally conceived entirely as a sanitary measure. During the summers of the late 1400s, hoards of little flies frequently invaded Central Europe. By the early 1500s, several principalities in what is now Germany had passed laws requiring that all food and beverage containers be covered to protect consumers against these dirty insects. The common mug also had to be covered, and this was accomplished by adding a hinged lid with a thumblift. This ingenious invention was soon used to cover all German beverage containers while still allowing them to be used with one hand. This covered-container law and several other public health laws were enthusiastically passed and vigilantly enforced as a result of public fears about a return of the Black Death. In the period from Roman times to the 1300s, sanitation had continually declined. During the years of the Black Death, it became obvious to all, with 95% of those in filthy areas dead and only 10% dead in clean surroundings, that the plague was somehow related to unsanitary conditions. The covered-container law was only one in a whole series of sanitary regulations that were passed in Germany after the plague - pigpens could not be adjacent to streets, old or diseased meat had to be labeled as such, and beer could be brewed only from hops, cereals, yeast, and water. Strictly enforced regulations concerning the quality and transport of beer in many of the German provinces resulted in a tremendous improvement in the taste of beer, and also had an impact on stein making. Many records show that average beer consumption increased to about two liters per day in many places. Beerhouses, city hall cellars, and taverns began to proliferate in the 1500s. There is an old saying: "The German will place great value on that which brings him his food or drink." Everyone in Germany needed a personal drinking vessel to be proud of. Local brews in many other parts of Europe were still being made with rotten bread, cabbages, eggs, and anything else at hand. Soon the Bremen, Hamburg, and other clean northern Germany beers became famous and were exported throughout northern Europe, and even as far as the East Indies and Jerusalem. Such beers raised a new need for relatively inexpensive, but durable, large containers - the search for appropriate materials was on. As for individual beer vessels, up to the 1400s, well-to-do Germans had pewter beakers. A few of the wealthiest even had silver vessels. These metal containers, and those made of glass, remained too expensive for general use or for large containers. Some wooden beakers were used, but other than wood, porous earthenware was by far the most common material for beer beakers, mugs, and the larger containers. However, both the wood and the earthenware broke easily, which may have been a blessing because these materials absorbed beer, giving off a smell that got worse with each subsequent use. Scientific experimentation was begun to try to improve the earthenware. The all-powerful Roman Catholic Church, long at odds with science, would previously have squelched all such scientific inquiry. During the Black Death, churches claimed prayer would end the plague and sometimes announced that Revelations had begun. In either case they lost some of their hold on the public, and more pragmatic scientific views began to prevail. The subsequent rise of science and its marriage with art has been credited with starting the Renaissance. The obvious earthenware experiments involved raising the firing temperature past the usual level of 500°C (900°F). Higher temperatures, however, could not be achieved merely by throwing more wood into the furnace; they required new furnace designs. One such invention, which produced temperatures up to 1200°C (2200°F), had a furnace on the lower floor, and above it, through some slats, a ceramic firing chamber entirely enclosed in brick, except for small flues. At these extreme temperatures, not only was all the moisture driven out of the clay - as in earthenware production - but also the clay vitrified, or partially melted, into a solid stone-like material, hence the name stoneware. Stoneware required days of firing and dozens of cords of wood, but the product proved to be far superior to earthenware. It is resistant to chipping and cracking, and is not porous, resulting in a much more sanitary container. The high cost of stoneware steins, especially after the covered-beverage-container law required lids, made steins worthy of some fine decorative ceramic art. Renaissance artists supplied many designs for applied and carved stein decorations, and colored glazes complemented these designs nicely. A clear saltglaze had been invented about 1400, and a blue glaze from cobalt oxide was also known at that time. A chocolate saltglaze was invented in the 1600s, and a manganese oxide purple glaze was invented around 1650. Tankards were soon decorated with shields and historical, allegorical, and biblical scenes. Beer drinking had now also become a pleasure for the eyes! And the landless day laborers, the masses that had survived the Black Death, were in a position to command higher wages for their services. This meant they could afford a few modest luxuries, and the personal tankard became an important status symbol and display piece for these Germans. Once again, consider the historical situation. The guild system was well in place in the 1500s and guild representatives held powerful positions on the city councils. Although no records of it exist, the Pewter Guild was no doubt an important sponsor of the covered-container law that prompted creation of the beer stein. The Potters' Guilds are known to have continually pushed up minimum standards for the quality of both the decorations and the stoneware, thus making steins increasingly attractive. Initially, a few glass bottles were made in Delft to be used for shipping some of that northern beer. But soon the fine clay of the Cologne area was used to make large stoneware jugs. The shipping industry was rejuvenated, and the beer export and stein-making businesses boomed, producing some extremely wealthy merchants. Such wealth did not go uncontested, and the resultant Thirty Years' War had changed many things by its conclusion in the 1640s. It was a war fought with fire. Virtually all of the northern breweries were destroyed, and most of the southern vineyards as well. A few southern breweries in cloisters survived and, more or less by default, Bavaria became Central Europe's beer land. Beer soon replaced cider and wine as the beverage of choice throughout Germany. An expanded new market for beer steins developed, and the stoneware industry from the areas of Kö1n and Koblenz responded. Pewter, silver, and glass luxury steins were also available, but the Chinese connection for the luxurious Ming porcelain mugs had been disrupted by rebellions in China in the middle 1600s. No one in Europe knew how to make porcelain, but several German potters were quick to jump in with a porcelain substitute: faience. Faience is earthenware with a porcelain-like white glaze made from tin oxide. German faience was not as durable as the Chinese porcelain, but it was far less expensive and had two aesthetic advantages. First, the motifs on German faience were popular late-Renaissance and early-Baroque designs, not foreign-looking Chinese figures. And second, the cobalt oxide of China was contaminated with purple manganese oxide, and the Persian cobalt oxide that the Chinese artists sparingly mixed in would often diffuse badly. The purer German cobalt oxide supplies were bright blue and allowed for crisp lines. So by the time the Chinese porcelain supply was re-established, German faience had gained a firm hold on the stein market. Throughout the 1700s, the Pewter Guilds maintained their tight hold on the covered-container law. It seems certain that this involvement was responsible for keeping the lidded design of the stein from disappearing since there has always been a tendency to return to beakers and a master stein, or to find some other way of getting around the expense of an individually hinged lid. Yet by the end of the 1800s, when the covered-container law was apparently no longer in force, over 300 years of conditioning had taught Germans to view a stein as incomplete without a lid. Thus, steins with lids are here to stay. Many of the trends that were in place just before 1700 continued to strengthen thereafter. For example, by 1750 there were over 4000 breweries in Bavaria. And the art and production of stoneware and faience steins increased substantially, all the way into the late 1700s. European porcelain was invented in 1709 but did not begin to have a noticeable impact on stein making until the 1720s. Several porcelain factories were started in the 1700s, but their products were very expensive. Only the wealthiest Germans were drinking beer from porcelain or glass vessels at that time. The quality and taste of beer "the flowing bread" continued to improve. Besides offering taste and fellowship, beer was considered to be important for the constitution, with the ability to induce strength, health, and relaxation. From the earliest times right up into the 1800s, many considered beer to be the most effective medicine known - the drink from the gods. Although glass beer beakers were used in Roman times, the Church viewed glassmaking as heathenish and suppressed its production during the Middle Ages. The art of making and enameling glass was not relearned by the Germans until the late 1500s. These early enameled items were mainly beakers and pokals. 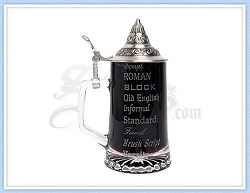 A few engraved glass steins began to be used in the 1700s. However, partly because of their fragility and partly because their costliness limited the number produced, not many of these early glass steins still exist. The color of this glass was almost always clear, which required some special efforts to achieve because the usual Waldglas of the time was partially made with wood ashes that caused a definite greenish tinge. The use of clear glass would seem to support the theory that an important feature of the early glass stein was to show off the rare clarity and color of the costliest beers that were brought from some distance. Toward the end of the Baroque period, around 1800, pewter and silver tankards were still uncommon in Germany. However, the English, and to some extent the Scandinavians, had by now adopted the finished look of a lidded mug. And except for a few ceramic factories, they were making pewter and silver steins exclusively. The Scandinavians had also perfected a method of making a nice all-wooden tankard, complete with a wooden hinge. The few German wooden steins from this period generally have pewter mountings and pewter overlaid designs, and even these were no longer being made by 1800. 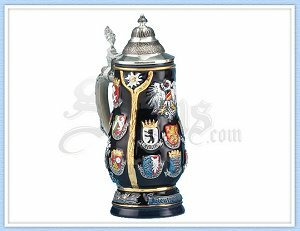 In the 1600s, it was rather easy to determine a stein's origin; every small region had considerable pride in its own typical form. The Bohemian, Austrian, and other southern tankards were wide and sturdy. Sleek and tall drinking vessels were preferred in the northern areas. The western steins were gray stoneware with blue decoration and the eastern steins were brown-glazed stoneware. Soon after 1800, another transition began that was as significant and unpredictable as that which brought on the Renaissance. The Napoleonic war and other rebellions of the time so diminished the aristocrats' wealth and power that the newly monied middle class became the most important market for steins and other artistic products. This middle class cast off the Baroque extravagances, preferring instead a sturdy, functional folk art. This era is known as the Biedermeier period. Also around 1800, secularization had resulted in the closing of many monasteries, but there were enough private breweries to assure that cloudless beer, without dregs, would still be available to the masses. And perhaps pride in the appearance of the clear beer led, in part, to a major influx of glass steins into the marketplace soon after 1800. These glass steins usually carried enameled folk art designs. 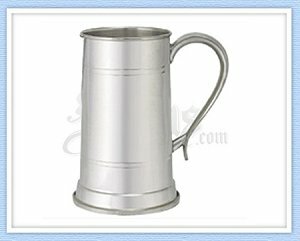 The straight-sided, cylindrical pewter tankards also became very popular at this time. Engraved or stamped designs were common, especially those using the same type of folk art motifs. Occasionally, pewter steins with remnants of painted decorations are found from this period. Considering that paint applied to pewter is not durable, this type of decoration must have been quite common to still be visible on any surviving examples. Porcelain and silver steins continued to be made in the early 1800s, always with the Renaissance and Baroque designs that still appealed to the wealthy. In the early 1800s, the preference of the masses was so clearly for glass and pewter that nearly all of the faience workshops were permanently closed. Most stoneware manufacturers stopped making steins and turned to everyday items such as bowls, jars, and wide-mouthed jugs. The Villeroy & Boch firm of Mettlach was established at this time. Although the family was wealthy, the von Bochs? plates and other utilitarian items had to appeal to common tastes in order for the company to stay in business. However, as the Biedermeier period was drawing to a close in 1850, the Mettlach factory, with its aristocratic owners and classically trained artists, was ready to respond to the upcoming change in artistic tastes. During the early 1800s, many archaeological expeditions had uncovered outstanding examples of Greek, Roman, and Renaissance art. By about 1850, the public had been so captivated by the beauty of these finds that they were ready to forsake the mundane, functional styles of the Biedermeier period. By 1850, art instruction consisted entirely of having students copy the forms and designs of the archaeological finds from the Renaissance and Classical periods. The new style that resulted has been called neo-Renaissance and neo-Classical or, more commonly, Historicism. As for beer steins, the white clays of the Kö1n area were again used to make stoneware steins with Renaissance allegorical motifs. These steins have gray saltglazed relief decorations and often have inlaid porcelain lids. In later years, a major resurgence of interest in stoneware steins resulted when Reinhold Hanke of the Westerwald region made blue and purple saltglazed Historicism pieces. Molds were used to avoid the manufacturing expense encountered with the labor-intensive originals. 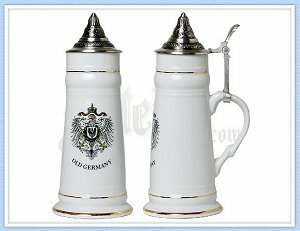 The molded products were no longer unique steins ? they were mass-produced, as their seams clearly attest. But there was an artistic advantage to using molds, and Hanke, Dümler, and other stoneware manufacturers exploited this to the fullest. The advantage was that molds could be used to quickly reproduce painstakingly carved, elaborate relief-work on hundreds of steins. In the second half of the 1800s, glassmaking techniques had progressed enough to allow molds to also be used to mass-produce glass steins. The surprising sturdiness of the thick molded glass steins no doubt helped to increase their popularity. Other glassmakers? tricks were also applied to glass stein production. Multicolored glass overlays, acid etchings, staining, and pewter overlays were used to make some rather spectacular glass steins. Advances in the use of moisture-absorbing plaster molds helped the porcelain stein manufacturers. These molds allowed novel shapes to be produced, making the so-called character steins much more common. Also, due to the variation in the thickness and thus the translucence of the porcelain, molds could be used to create the lithophane scenes that are visible in the bottom of many porcelain steins. The Mettlach factory, with its classically trained artists, was quick to introduce the Renaissance motifs into its new line of relief steins. Experiments with glazes and clays led to some new, brightly colored Mettlach steins of the mosaic and etched types. 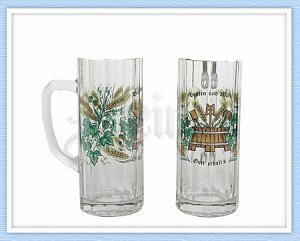 These were popular enough that many laborers were willing to spend a week?s pay on one of these beautiful steins. By the 1900s, the designs and motifs of Historicism had begun to lose favor and to be replaced by town scenes, occupational emblems, common social scenes, and commemoratives, particularly of military service. To meet these diverse new demands, many potters entered the market with stoneware or glazed pottery steins. A new art style, Art Nouveau, was gaining limited popularity when, around 1910, political and economic turmoil threw the stein industry into a tremendous slowdown. With the subsequent outbreak of World War I, the materials and labor needed by the pewter industry were converted to use for munitions production, and stein making virtually ceased. Production of stoneware, glass, and porcelain steins, especially character steins, increased during the 1920s, Except for slowdowns during economic and political disturbances, notably during the early 1930s and the early 1940s, substantial quantities of steins have continued to be manufactured. The modern period owes a great debt to Historicism and its reverence for Classical and Renaissance art. It was during the Historicism period, from 1840 to 1900, that most of the great public museums were started. The general public, not just the art intellectuals, now wanted to see artistic masterworks, including Renaissance steins. This appreciation for antique steins led to museum and public collecting of steins. One major new direction in stein production in the Modern period, especially since World War II, has been the introduction of tremendous numbers of relief pottery steins. The last forty years have seen many changes, with economics playing a key role. America has been the primary market for new beer steins of most types, especially the limited editions. Some companies have been very successful, while others failed to cope with the competition and have stopped producing steins. In the early 1970s, Ceramarte of Brazil entered the stein-producing business, rapidly becoming the largest producer of beer steins in the world.